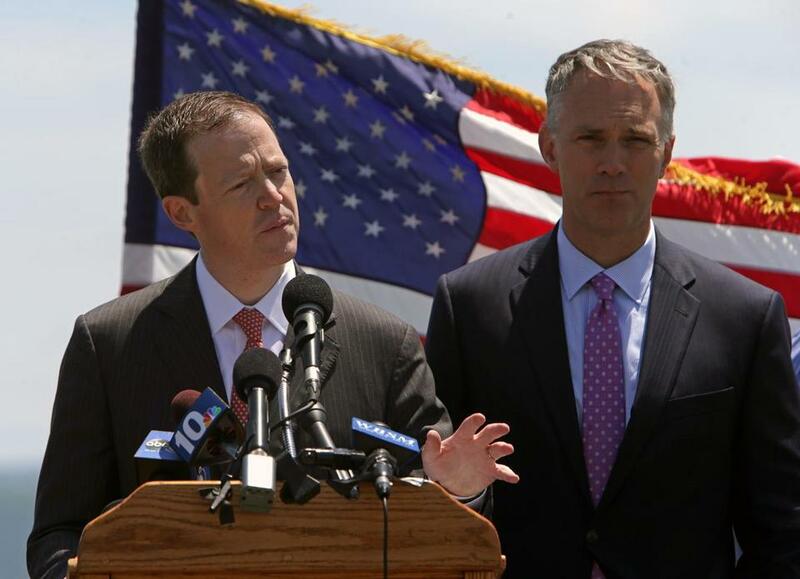 Boston 2024 CEO Rich Davey (left) appeared with New Bedford Mayor Jon Mitchell last week as the city was selected to hold Olympic sailing events should Boston host the Olympics. Ask Governor Charlie Baker what he expects from Olympic organizers as they unveil “version 2.0” of their bid this month, and he sounds like an impatient investor demanding a better business plan before he buys in. As Baker’s barrage indicates, intense demands are piling up on the local bid committee as it attempts to reestablish credibility and community support by revising its venue plan and filling in crucial details about its nearly $10 billion budget. The challenges are logistical (finding a new location for beach volleyball), financial (building an Olympic stadium without tax dollars), and quasi-metaphysical (ensuring the Olympics won’t distract from other priorities, such as better schools). The rollout began last week, with the announcement that sailing would be moved from Boston Harbor to New Bedford, and is expected to continue over the next three weeks as the local bid committee seeks to boost support ahead of a US Olympic Committee meeting at the end of the month. A WBUR poll released Wednesday indicated that 49 percent of Massachusetts voters oppose bringing the Olympics to Boston, while 39 percent back the effort. Voters continue to oppose Boston’s bid for the 2024 Summer Olympics by a significant margin, a new WBUR poll shows. Another major challenge, he said, will be finding viable venues in a “dense, old city” like Boston, where there are competing claims on nearly every patch of land. Perhaps the most vexing venue is the 60,000-seat temporary Olympic stadium in South Boston, which is planned on land now occupied by the New Boston Food Market, a cooperative of two dozen meat and seafood wholesalers, and by an assortment of MBTA repair garages. Boston 2024 has suggested building platforms over the garages and relocating the wholesalers, but has not yet reached a deal with them, according to Michael Vaughan, a spokesman for the market. “Our position has been we love where we are, but we’re fair people, and we’re willing to have a conversation,” he said. Paying for the $550 million stadium is another significant hurdle. As with its other venues, Boston 2024 has promised the stadium will be privately financed. But in its initial bid, the group told the USOC that it could use public financing for land and infrastructure costs there. When the media revealed the plan, sparking an uproar, the group backed away from the proposal, but did not outline a new financing scheme. Victor A. Matheson, a sports economist at the College of the Holy Cross, said the gap is one of a several “magic asterisks” in Boston 2024’s budget — critical details that have to be filled to avoid cost overruns and taxpayer bailouts. He said he cannot imagine a private company paying hundreds of millions of dollars to build a stadium, only to have it dismantled. Even if the company won the right to develop the land after the Olympics, “that’s an expensive way to build apartment houses,” he said. The initial bid, he said, also estimated that security for the Games would cost $1 billion and be paid for by the federal government. Matheson said that estimate is about $500 million too low and should include additional costs for local and state law enforcement agencies. Boston 2024’s initial bid also relied on $1 billion in what it called “other revenue” — without explaining where that money could come from, Matheson said. The next version, he said, must make clear how that $1 billion is funded. Like the stadium, the Olympic Village in Dorchester — which was initially proposed without consulting some local landlords — is expected to undergo changes in the revised bid. For example, Boston 2024 originally suggested that a retail complex at the Village be built where the Boston Teachers Union is planning a new hall. Since then, Boston 2024 and union officials have spoken, but the union has not ceded its land to the Olympics. “We’re still planning full speed ahead, and we intend to break ground as soon as we can,” said Richard Stutman, the union president. After the Games, Boston 2024 wants to turn 6,000 of the Village’s housing units into dorms for the University of Massachusetts Boston, a vision the university has embraced. But Boston 2024’s proposal to convert the remaining 10,000 units into 2,500 middle-income homes and relocate them to parcels throughout the city is not practical, said Marc Draisen, executive director of the Metropolitan Area Planning Council, the regional planning agency for Greater Boston. Draisen said it would be too expensive to convert the units into family housing, buy land in other neighborhoods, and build new foundations and utility connections. 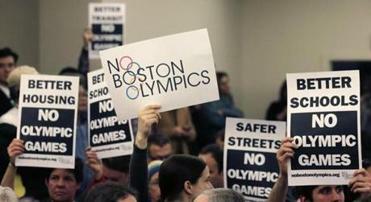 Boston 2024 is also contending with local opposition to some of its venues. Somerville’s mayor does not want a velodrome, as proposed in the initial bid. Beach volleyball needs a home, after Boston 2024’s plan to stage the event in Boston Common incensed advocates for the park. At Franklin Park, advocates have balked at hosting equestrian events and the modern pentathlon. Outside of Boston, the situation is the reverse: Smaller cities are clamoring for a slice of Olympic glory. Worcester wants to steal the rowing competition from Lowell, Springfield wants basketball, and Holyoke volleyball. Shipping events to these cities could help Boston 2024 build statewide support, but detract from its promise to hold the most walkable Olympics in modern history. And yet, even as Boston 2024 obsesses over those details, it still faces deeper questions about the city’s desire to host the world’s largest sporting event. David Scharfenberg and Mark Arsenault of the Globe staff contributed to this report. Levenson can be reached at mlevenson@globe.com. Follow him on Twitter @mlevenson.